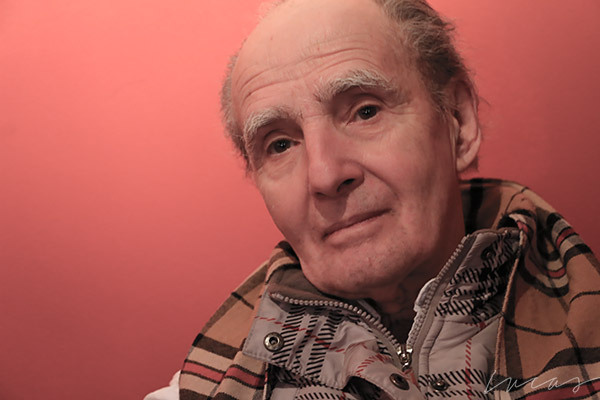 Photo of Barry Lavender © 2015 by Ralph Lucas. Used with permission. Barry Lavender in a candid black & white photo taken while on location for the 2013 feature, The Honeymoon. Once upon a time he would have been described as a hippy and he is a former Greenpeace activist, but Barry Lavender has worked in the film industry for over fifty years. He is an expert hand-rendered letterform artist. Early in his career he hand-painted wild west signs on the set of Robert Altman’s McCabe and Mrs. Miller and worked behind the scenes on Gordon’s Pinsent`s The Rowdyman. For The Honeymoon, he not only acted in the movie but served as co-producer and designed all of the on screen graphics, packaging, tattoos and signage. 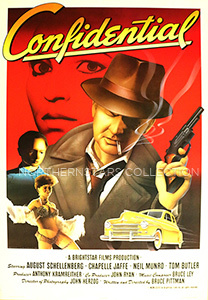 He was the co-designer of the movie poster for the August Schellenberg 1986 film Confidential and donated a rare copy to the Northernstars Collection in 2014. This poster for Confidential was scanned from an original in the Northernstars Collection.